Now closed; was a vegan cafe/takeaway just off Coldharbour Lane in Brixton. The old review is retained below for people who want to know what it used to be like. 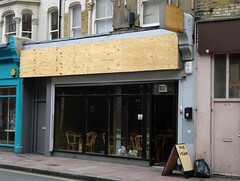 As of August 2008 the property was up for rent, with a facade indicating that after it stopped being Maio it turned into a sandwich bar called The Sandwich Bar. Vegan cafe/takeaway just off Coldharbour Lane in Brixton. They have a variety of different African/Afro-Caribbean dishes on offer (the chef is Senegalese), and you can mix and match some or all of them for eat-in or takeaway. A small meal costs £3.50, a medium £5, and a large £6.50. Cans of e.g. mango juice are £1 each. It all seemed a bit disorganised, and some of the food was tepid when it would have been better warm, but it's all vegan, and it's very well-priced for what you get, and it's real food with lots of vegetables in (unlike the vegan Chinese buffets scattered around London). I think they might do fresh juices as well, but forgot to ask. Last visited by Kake, 31 August 2007. Last edited 2008-08-30 15:43:05 (version 4; diff). List all versions. Page last edited 2008-08-30 15:43:05 (version 4).